Base of Operations: X-Statix HQ in Santa Monica, California; formerly a small town in Minnesota. Powers: Fanboy was a mutant who could bend reality at will. He could restructure matter, both organic and inorganic, teleport objects or beings, etc. He could also raise and animate corpses, though that is probably just a use of his other powers. Height: 5' 7" Weight: 120 lbs. (X-Statix#3 (fb)) - Arnie was a mutant who had been injured and hideously scarred under unknown circumstances. As he lay comatose, he heard the voice of Edie Sawyer, U-Go-Girl, which stirred him out of his inert state. He soon revived completely. (X-Statix#1-4)- Arnie Lundberg claimed to be the biggest X-Force fan in the world, especially of U-Go Girl. He blamed the Orphan for killing his favorite member. It was eventually revealed that he was a mutant and was using his powers to control a small town in the Midwest. He was also psychically sending images of U-Go Girl into the Orphan's mind in hope that Guy would attack him. Preparing for the attack, he unleashed an army of the dead to attack Solomon O'Sullivan's superteam, O-Force. The Orphan arrived and saved the team and confronted Arnie. Arnie sent him flying out a window and into the undead army. Guy was saved by X-Statix and Guy convinced Arnie to turn his powers to healing the mess he has called. The Orphan then nominated Arnie for X-Statix membership so that they could keep an eye on him. 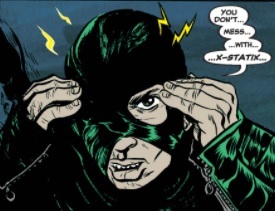 (X-Statix#5)- Arnie joined the team as the "Mysterious Fan Boy", with his identity concealed from the public with a mask. Lacuna, who could move between seconds, removed his mask on live TV, revealing his identity to the world. To prove that he has changed his ways, "Fanboy" joined X-Statix on a mission against the indestructable Razorhead where he had a heart attack after killing Razorhead and saving the team. After he died, the Orphan argued with Lacuna over his decision to have Lacuna inject him with a chemical that caused Arnie's heart attack. Comments: Created by Peter Milligan and Michael Allred. Mr. Clancy was a man who lived in the town being controlled by Arnie Lundberg. Arnie had transformed his face, so that Clancy only had one eye and no mouth. After Arnie had transformed his music teacher's hands, he said "good afternoon" to Mr. Clancy, to which Clancy replied with a terrified "mphhh!" It is unknown whether or not Arnie returned Mr. Clancy to normal when he fixed everything else in his town before joining X-Statix. Mr. Mullen was also a man that lived in the town that was being controlled by Arnie. He was killed by Arnie for trying to talk to a tourist. Nathan Malloy was born in 1888 and died in 1911. Bud Corby was born in 1932 and died in 1973. Both were resurrected by Arnie to battle the Orphan. 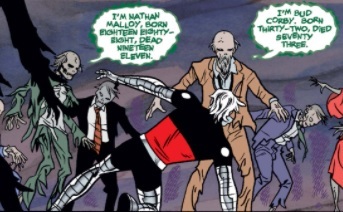 The Orphan shoved his hand through Nathan's skull, effectively stopping him and Bud's head was vaporized by the arrival of Venus Dee Milo and other members of X-Statix. Mrs. Lundberg was the mother of Arnie Lundberg. After Arnie awakened from his coma and his powers manifested, she somewhat treated him with a terrified, forced love. A few days before his battle with X-Statix, she cooked him fish pie, his favorite. Later, when Arnie rearranged the molecular structure of his music teacher's hands, Mrs. Lundberg lightly scolded Arnie. Once the Orphan arrived in town and busted into Arnie's home, Mrs. Lundberg arrived in Arnie's room and offered both the Orphan and Arnie some cookies. This act of kindness prompted the Orphan not to kill Arnie and have Arnie join X-Statix. After Arnie's death on a mission with X-Statix, the Orphan showed up at his visitation, where he comforted Mrs. Lundberg.